This all began with the cancellation of Sunday waffles. I bought two pounds of bacon in preparation for one of our regular rounds of Sunday Waffles. That’s a gathering we often host for friends and neighbors: we provide the skyscraper of waffles, scrambled eggs, crispy bacon, and strong coffee, not to mention a backyard trampoline (for the kids) and leafy deck to eat on, and our guests bring themselves and a bowl of fruit. But a couple weekends ago we were at the ready to host, groceries bought, linens washed, and then our friends cancelled due to a fever in their house. Over the course of the next week I found myself working around the log of bacon. Meaning a crisped slice found its elegant way into just about everything. I am already working through our steady harvest of garden vegetables: tomatoes, zucchini, green beans, and didn’t realize how a bit of bacon could transform these vegetables and their dishes continuously. I get it, bacon is already adored enough, but it’s a food I never really gave stature too. And now…and in summer of all seasons. Bacon on top of homemade pizza with fresh tomato and zucchini—check. Bacon added to garden vegetable frittata—check. Bacon tucked in to tangy potato salad—check. Bacon peppered over green bean casserole—check. Bacon slipped in to a wild summer minestrone—check. Bacon to crumble over crunchy green salad with fresh corn—check. And so very many BLTs, what can I say. An ode has begun shaping itself. This unexpected suitcase of bacon has positively surprised me by repeatedly smiling on my seasonal fare. We love these vegetables on their own (a warm handful of cherry tomatoes) and giving them center stage during their season (penne with seared zucchini). But bacon comes in like a little rouge on the lips, gently sharpening these already lovely things. It’s time. Harvest. My arms overfill each time I walk through the vegetable garden, which is each day. It’s that time of year, when everything is voluptuous and a bit wild. A short row of bush beans is excitable and wishes me good luck with all the beans. Constellations of cherry tomatoes in and around each bed; they hide too. The zucchini, well you know. Peas, I can’t keep up and now most of you are swollen on the vine. But I love it. Beets and their greens, kale soldiers, chive fountains, basil and mint draping over it all. My favorite garden motion, tugging the hair of the carrots and twisting them up and into the lit world. And then there are the cucumbers. Only a single plant this year, since I have learned that one happy cucumber plant can get overwhelmingly fruitful. Now that it’s mid-August our vine produces at least a single cucumber each day; that’s a lot of cucumbers, even for a family that loves them. 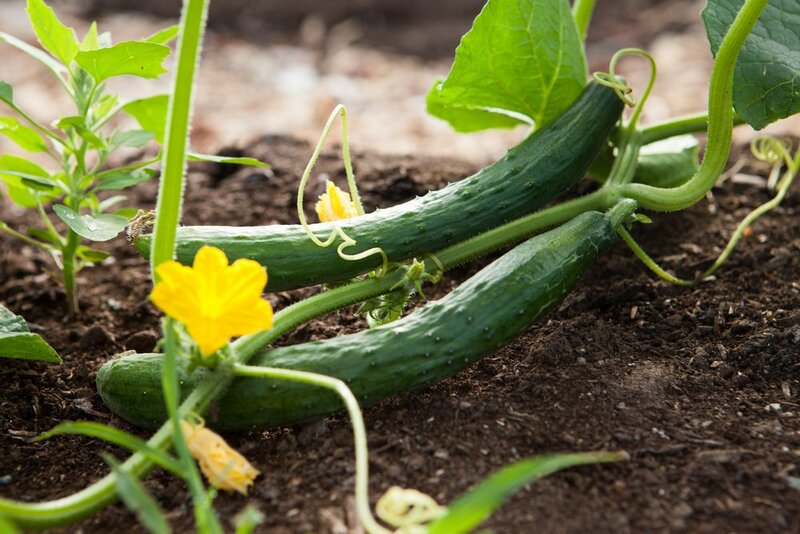 Beyond pickling and slicing them into salads, I am always looking for ways to make most of our cucumber harvest. Tzatziki, a cucumber and yogurt sauce, does the seasonal trick, since most of the foods (like grilled fish or meat, or fresh vegetables) it pairs well with are the foods of summer. Rooted in Greece, tzatziki is a traditional accompaniment to falafel, gyros, kabobs, baked potatoes, vegetable and pita platters, and is a refreshing partner to spicy dishes. If anything, this dish is fun and uplifting to pronounce. I encourage you, especially this time of year, to build your meals around these seasonal aspects. Build around a seasonal sauce, such as this one. Why not? Peel, seed (if necessary), and dice 1 large English-style cucumber. Place the cucumber into a fine-mesh strainer over a bowl and sprinkle over 1 tablespoon kosher or sea salt. Let the cucumber sit for 15-30 minutes, allowing the salt to draw the moisture (and any bitterness) out. Meanwhile, stir together in a medium bowl: 2 cups Greek-style yogurt (thick, and preferably whole-milk), 1-2 garlic cloves (minced or finely grated), 1 tablespoon of fresh lemon juice, about 2 tablespoons of fresh mint or dill (chopped), a pinch of sugar and a twist of black pepper. Once the cucumber has relaxed pat it dry with paper towels, or gently squeeze it in a paper towel, removing any excess moisture. Stir the cucumber into the yogurt mixture and taste for further kosher or sea salt, or any other flavors. To serve, drizzle over some extra virgin olive oil (optional) and dust over some ground paprika (optional). Serve immediately, or chilled from the fridge.